Knitting Nancys (a.k.a. French knitters, knitting nobbies, spool knitters, etc.) have become something of an obsession for me this week. I’ve been thinking about what to include in a beginning knitting class for kids that I might teach at Sam’s school next fall, so I purchased one at the Bobbin’s Nest in Santa Clara last month. I never got around to trying it, however (the directions seemed daunting), until I found this Giant Knitting Nancy by UK design company Superblue in a recent Vogue Knitting magazine and watched the video that you can find on Superblue’s page about the project here. You can see the giant knitting nancy in the background of the photo to the left. The video shows someone actually using it to knit and, on that scale, I easily understood how it worked and could make sense of those directions for my much smaller-scale knitter. Once I started exploring these tools on the internet, I found many versions of a DIY toilet paper roll knitter and set out to make my own. What I love about both the giant knitting nancy and the toilet paper roll version is that you can knit with only your hands and the knitter. 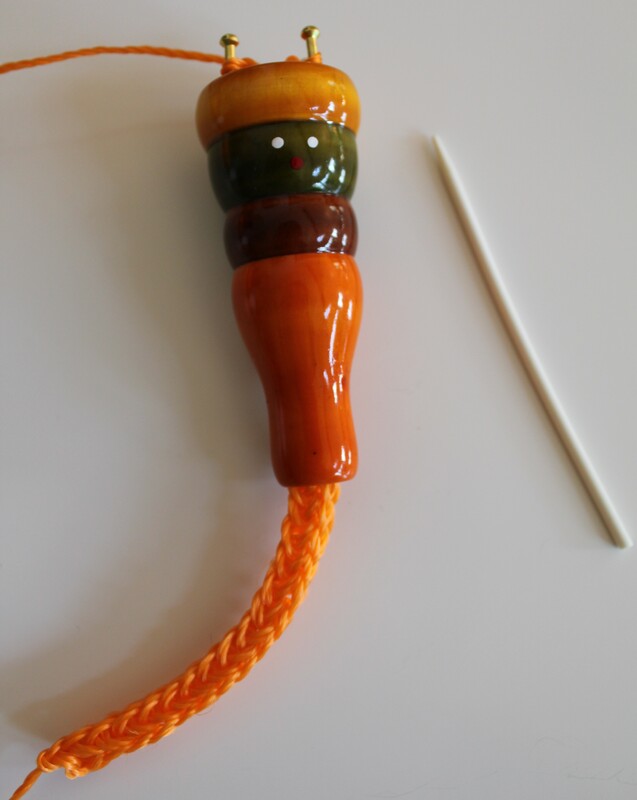 You don’t need a tool like the one shown in the photo with my purchased knitting nancy to help you manipulate the loops of yarn on your pegs. This is a huge plus for kids (and adults for that matter). It’s so easy and so fun to do. Kind of addicting actually. 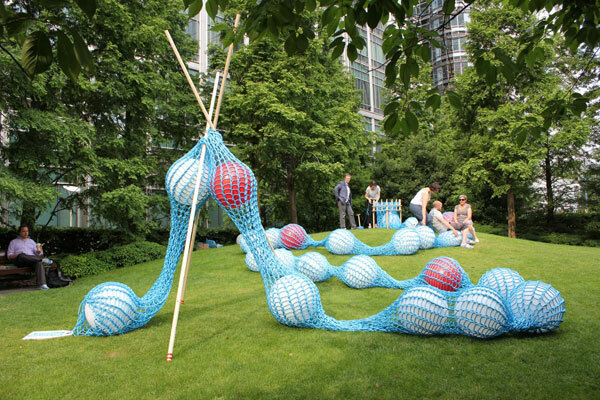 Your only problem will be what to do with the long, hollow, knitted tubes you create. I found the colored craft sticks for my DIY toilet paper roll knitting nancies at Michaels. They are cute, aren’t they? The only drawback is that they will stain your fingers during the first use of your knitter. They are taped to the toilet paper roll with colored tape. But again, color is optional. What I learned from making my own knitters is that the tube size and number of pegs determine the circumference of your knitted tube, while the amount of space between pegs determines how tight or loose your knitting will be. Of course the material you knit with will impact these things as well, so you really need to experiment to get the effect you are after or to discover one that might surprise you. Who says you have to use all the pegs? What would happen if you just used 4 … or 3 … or 2? There is a wonderful resource on the internet called The Lost of Art of Knitting Nancys. There you can find everything you ever wanted to know about them, including how to make and use them. It was put together by a mechanical engineer who was in third grade in 1959 when a knitting nancy fad hit his school. He says it made an imprint on his brain that carried through to middle age and the creation of his knitting nancy page. Do scroll through and read the final paragraph where he explains this. It is funny, charming and very well-written. Some of his methods look rather complex, but there is more than one way to use these knitters. The six-year-old in this video shows the most simple method I’ve seen. I do something similar, but I wrap my yarn around the peg, and I work in the opposite direction. Whatever method you use and whether you are six or sixty-plus, knitting with a nancy is a blast. To find links to these blog posts please click here. you’re welcome to my stash of popsicle sticks any time you want to make more – I think unstained would be better for the yarn and your hands. I bet the kids will love it. 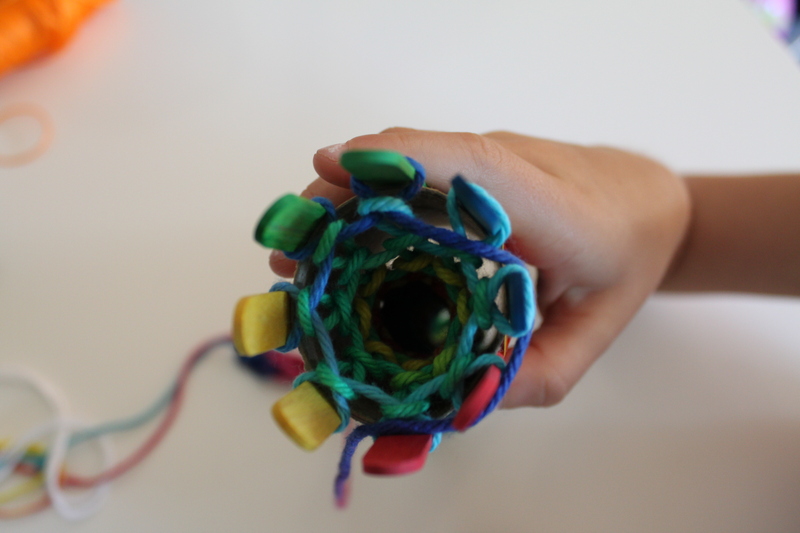 You could make coasters or trivets with the ropes, stitch them together in a circle going around and around. OR – I KNOW – make a really big bowl and then felt it. Ok, maybe that’s too much. But it’s a really nice idea to get the kids into the textile arts. Hi! You may be interested in the Yahoo Spoolknitter Group and the Flickr Spool Knitter group both of which I manage. Yahoo especially, you will find lots of ideas, patterns, links, etc. … we even have competitions. I have a blog too – http://spoolknitter.blogspot.com …. hope to see you soon! We wonder if we could link this article (just one photo and a link) on our creative blog ‘Deze is ook leuk’. It would be nice to share this wonderful idea with our readers. Hope to hear from you soon. Kind regards! You certainly can – thanks for asking! Une très bonne idée 🙂 Good ideas!!! Thank you so much. I just posted some doll accessories. Please visit again if you’d like to see them! When I was in grade school my cousins and I had some made of wooden thread spools with small brads hammered into the end of them. We may have used a nail to work the yarn. That sounds cool. Any tube with some kind of pegs will work; I’ve even seen a plastic tub (like one used to hold sour cream) with the center cut away and pegs cut into the top used to knit a scarf. Of course, you can buy peg knitters, but there is something so satisfying about making your own! I like using popsicle sticks as pegs because then you don’t need to use any thing other than your fingers to work the yarn. That’s funny because I actually got online to search “best quality popsicle sticks” the other day because I noticed that my remaining sticks were pretty ragged. I guess there is no market for a premium popsicle stick! You have to pick and choose or sand. Have you seen the plastic tub nancys where you just cut into the plastic to create the pegs? If you had a sturdy toilet paper tube you could probably do the same thing. I might just have to give that a try now that I think about it. Thanks for writing and good luck with your experiments. Tounge depressors would be smooth. Not sure how they compare in price though. Good idea – have to check them out – thanks! Great post! I would love to try this with my kids in my grade one class! Question….how do you start and cast on the yarn? and finish it off? Yes, I’ve thought it would be good to sit down and do a single post with all the basic instructions – casting on, knitting, binding off, etc. Right now the directions are split between various posts. Probably the most complete directions about how to do this kind of spool knitting (though on a larger scale) are in my post about the poly cord drawstring bag, part 2. I did this growing up (the mushroom looking one) but had completely forgot about it until I saw this post! Just taught my 3rd graders and they have TAKEN OFF — Thank you! I love hearing that – thanks for telling me! Yes! I also picked up a metal pipe reducer/expander at the hardware store the other week that I’m planning to turn into a spool knitter with the ends of some colored pencils. Sounds odd, but I think it will be really cool. PVC pipe is a great idea though.